Kelly Belandria I am validating that this deal works as described. 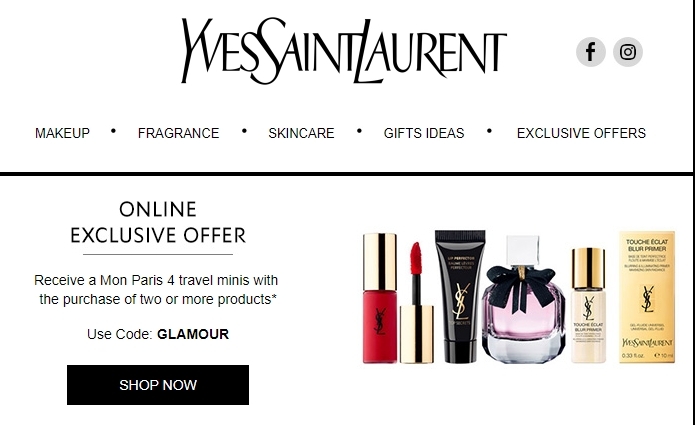 Enter code and Get Free Mon Paris 4 Travel Minis When You Buy 2+ Products at Yves Saint Laurent Beauty UK (Site-Wide). Javier Bello Coupon code "GLAMOUR" works perfectly as described, just paste the coupon code at your shopping cart, this is a limited offer, coupon code is not redeemable for cash, store exceptions may apply.